Kiddies call it your back to school special. Call it your juiced up college football preview. As for the gamblers, call it your guide to a late year comeback. This is the 2009 College Football Preview from your friends at LynchyRightNow. I'm answering the NINE, thought provoking questions of the 2009 College Football season. Without further adieu . . . . . Welcome to Boise, can you get out intact? Open strong. Proverbial kings of the Western Athletic Conference (WAC). An astounding 44-8 since the start of the 2005 season. Not a loss on home turf since December 28th that same year. [Insert your joke about the strength of schedule here.] On September 3rd to open the season, the Boise State Broncos welcome the Oregon Ducks to Idaho. The Broncos are playing host in their yearly PAC-10 hiccup. A contest Boise State has gone 2-2 in the past four seasons. This year it's different. Both the Broncos and Ducks are ranked in the preseason Top 25. You pick the poll and the Ducks and Broncos are interchangeable. What better way to kick off the season than with a little action. The Broncos and their dominating home record are giving four (-4) to the Ducks. Well readers, I'ma break it down real quick. 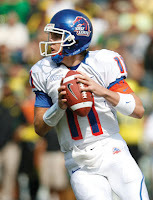 Broncos sophomore quarterback, Kellen Moore is out to impress. The Broncos rout the Ducks and plan to play BCS spoiler. Put it in the bank! Chinks in the armour. Are the Trojans that vulnerable? Yes, there are definite chinks in the armour of the '09 Trojans. (1) Newly anointed starting quarterback, Matt Barkley, will have his hands full as both he and new offensive coordinator, John Morton, adjust to their new roles. Can the Trojan offense function as well as they have in the past? Is it any wonder why head coach Pete Carroll was upset after losing Mark Sanchez to the lure of the NFL? (2) They didn't just lose Sanchez, the Trojans are replacing 8 starters on a top defense in college football last season. Rey Maualuga, Brian Cushing and Clay Matthews have all departed to the NFL. Those aren't run of the mill starters, those are smash mouth sideline to sideline defensive forces who still need to be replaced. Lastly, (3) Six of their first nine games are on the road, and not in nice places. Columbus, Ohio on September 12th. Berkeley, California on October 3rd. South Bend, Indiana on October 17th. All three opponents expected to have better years while their field generals take charge with another year under their belt. 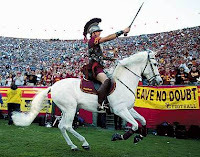 If the Trojans navigate this mess you can bet they'll be playing for something alot bigger than the PAC-10 Championship. If not, those chinks in the armour will look like gaping holes. This is a Gator Nation, your just living in it! You are, we all are. The Florida Gators are attempting to seperate themselves from the recent Trojans ('03 &'04 National Champs) and Tigers ('03 & '07 National Champs), they're embarking on their 3rd National Championship run since 2006, and believe me they can do it. On the shoulders of the iconic Tim Tebow, the Gators have become the most dominant program in the country from top to bottom. By kickoff on Saturday night the legions of Gator faithful await the defending national champions in their return to the gridiron, Gainesville will be rocking. From the September to January don't be surprised if the only team you hear about his Florida. Urban Meyer has become the greatest college football coach of his time. Tim Tebow, well you know the drill. Of course the season will present some surprises but the demise of the Florida Gators will not be one of them. To all the Gator Haters; 35-6 over the past three seasons, and these Gators don't play in the WAC! Will our returning Heisman Memorial winners join Archie? Oklahoma quarterback, Sam Bradford and Florida quarterback, Tim Tebow are both entering the season with Heismans under their arms. Tebow and Bradford have the opportunity to join Archie Griffin as the only college football players to win the games most coveted prize, twice. Both quarterbacks have top three teams in the country. Both quarterbacks lead offenses designed to put them on display. Both teams are poised to play on the games biggest stages. Tebow will play both in The Bayou and at South Carolina, which is sure to be a smash hit and give the Heisman voters those dramatic road shows. Bradford has an early test in south Florida against Miami and visits Lincoln in early November, the big stage plays right for the defending Heisman trophy winner. So, will Archie be making room???? NO! Your 2009 Heisman Memorial Trophy winner is none other than Longhorn, Colt McCoy. My prediction is Colt wrapping this up in October. Red River Shootout on the 17th, at Missouri on the 24th, and at Oklahoma State on the 31st. If Colt McCoy navigates this gauntlet of a month there is no doubt in my mind he has just as good of a shot as anyone. Happy now Archie? Is the Notre Dame hype for real? I want to be down on the Irish this year. I want to tell you how over-hyped they've become in recent weeks. I want to tell you Weis will be canned by January 1st. Unfortunately, I'm smarter than that. I'm a schedule guy, sue me. 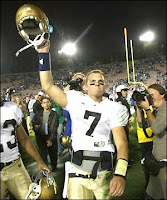 When it comes to the Irish and their 2009 schedule only one overused word comes to mind: SOFT. Sure, they get USC coming to their place, with two weeks to prepare. They've lost two straight to Boston College, did I mention Mark Herzlich has cancer? The Irish play 4, PAC-10 teams. Where's Cal? How about the three straight weeks of Big 10 challenge? Call me when the Nittany Lions or Buckeyes show up in South Bend. Don't even get me going on Nevada, Navy, and UConn . . .PLEASE!?!?! For all the Irish fans, your welcomes are in line for the schedule makers. For Charlie, here's your shot. Notre Dame is prepared for a top 10 finish and if that's the case, book your ticket to a BCS Bowl Game. Maybe the Irish are fraudulent but we'll never know, at least not till January roles around. Who will challenge the Hokies for ACC supremacy? ACC Football, only three things in life are guaranteed, death, taxes, and the Virginia Tech Hokies headed to the Orange Bowl in 2009. The Hokies open with none other than Alabama, a test early for an ACC team looking to take control out of the gate. Returning both Junior quarterback Tyrod Taylor and 1,000 yard rusher Darren Evans, the Hokie offense will do more than survive. As far as the ACC goes, I'm focusing on only one team to challenge Frank Beamer's squad, that'd be the Miami Hurricanes. Possibly be a year away as mentioned in this week's episode of TheRightNowPodcast, but the Hurricanes are back. The toughest schedule in college football belongs to those same Hurricanes, and that is my number one reason for giving them the nod. A September matchup in Blacksburg will let you know who wins the ACC, and we're not even a month in. Miami will be led by sophomore playmaker, Jacory Harris. The Hurricane quarterback responsible for a 5 touchdown performance, including 1 rushing, last season returns to lead a Miami team riddled with young athletic talent. Those are the players prepared to give Virginia Tech a rough afternoon. Jacory Harris, we're on to you. Sooners, Longhorns, & Gators . . . Who don't we expect? I debate to even include this section. Why? Read that line one more time . . .Sooners, Longhorns, Gators. All three return Heisman candidate field generals, have you not learned anything? I contemplate telling you dangerous the Big 12 has become. Maybe I throw out everything I've said and remind you of that school in So. Cal. or how about I just copy and paste exactly what I wrote about Florida. What fun would that be right? 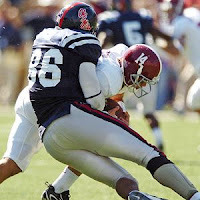 For a special treat to our SEC fans and of course co-host of TheRightNowPodcast I'm giving you the Rebels of Ole' Miss. Minus Peria Jerry and Michael Oher, Ole' Miss' top two interior lineman from a year ago, the Rebels return a slew of talent. Lead by junior quarterback Jevan Snead, Ole' Miss prepares to shock the nation as they did being the only team to drop Florida last season. The real hitch is the Mississippi defensive line. From Greg Hardy and Ted Laurent to Lawon Scott the Rebels have the toughest defensive front in college football, and that's after losing Peria Jerry, a first round pick. When I can give you an SEC team, I'll do it nine times of ten. Your safe with Ole' Miss. The Nittany Lions are a force, believe that! Did you think the Big 10 would go quiet? Think again. Sports Illustrated had it right, the Nittany Lions are not to be fooled with. 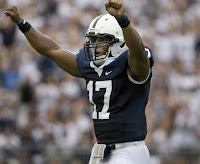 Returning senior quarterback, Daryll Clark, Penn State is tougher than ever. 19 Touchdowns a year ago, this quarterback shows no slowing down. As far as their schedule goes, see Ohio State on November 7th, before that? Don't get your hopes up. Penn State is returning to stack on the victories for for Joe Paterno. As for the Happy Valley defense, that is led by 6'10" defensive tackle, Jared Odrick. A tackle who recorded five sacks last season and returns this year to draw havock on the Big 10's elite. After their Rose Bowl defeat just a year ago the Nittany Lions return with work to do. Scoring 40+ in close to half of their games in 2008, the Big 10 opponents aren't taking them lightly. If the Rebels of Ole' Miss can't get it done for us. We bank on Penn State. Own it!
. . . And the National Champions are? What!?!? That's the question you wrap this up with? Florida v. Texas. I'm all chalk and I'm all honest. The 2009 National Champions reside in The Sunshine State. Tim Tebow adds to his legacy and becomes the only ( I didn't check it ) quarterback to record not 1, not 2, but THREE NATIONAL CHAMPIONSHIPS. Move over Archie Griffin, I'm forgetting your name. That's how we wrap up the 2009 NCAA COLLEGE FOOTBALL PREVIEW. Oregon by double digits, they embarrassed them last yr on their home turf, sending their starting QB off the field-- and had 2 late hit penalties, 1 of which got a Bronco ejected.... mark it down, Oregon BIG on the SMURF TURF!!! !